Homespun Stitchworks..... For the love of vintage: Little bit of history. Well today sees me chasing my tail a little. I just have to get some orders out and make sure I have enough products to sell. My sewing machine played up a bit! Its true you know - never let a sewing machine know you are in a hurry!! This week I am totally focusing on my work in hand. I am looking forward to my Jan/Feb months of designing and playing with my new threads with my new designs, but must just focus on the next few weeks before Christmas. I have a great friend coming over from Australia for my Birthday and would like to spend time with her so my focus must be finishing everything I need for the next few weeks. There is of course my competition piece and some more Christmas stockings and ribbons. I also love writing my blog and finding new and I hope interesting things for you all to read. I started to look into the history of embroidery and found that it is believed to originate in the Orient and Middle East. 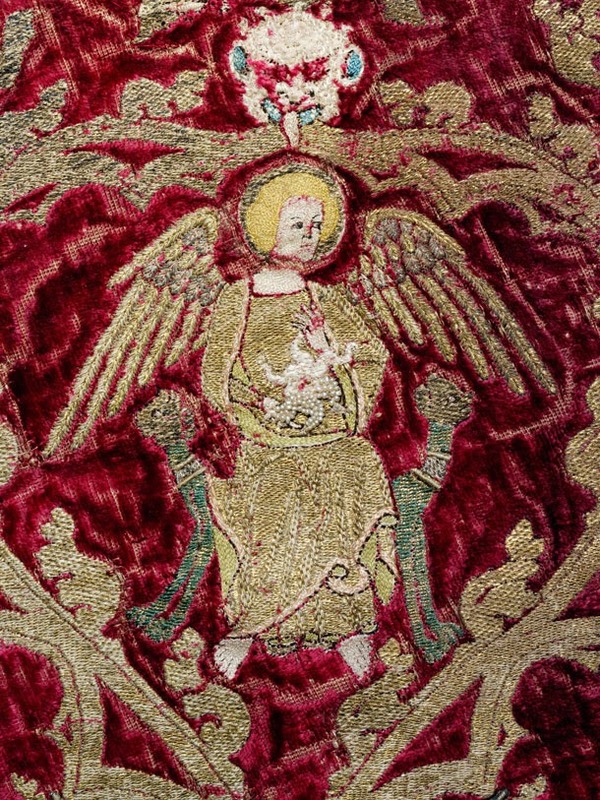 One of the greatest periods was 1250 through to 1350 when English work (Opus Anglicanum) was exported and admired. it was famed for it's fine gold work (mostly for the Church Vestments and furnishings) as they had the money then. 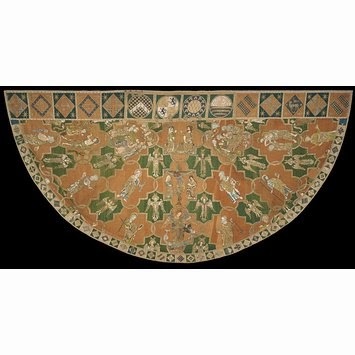 There is a piece in London's V & A museum - Syon Cope. During the middle ages embroideries representing historical events became popular with many being bought by wealthy households. 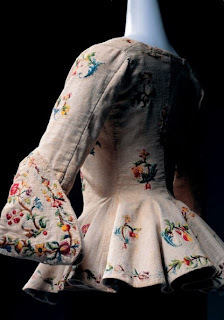 Embroidery in Tudor times became more confined to wealthier households on court dress and home furnishings. Servants were often hired because of their skill with a needle (learnt at home with their ABC's and the need to make do and mend) they learnt to do fine stitching for work. By the 1600's and 1700's samplers and pictures were in vogue. 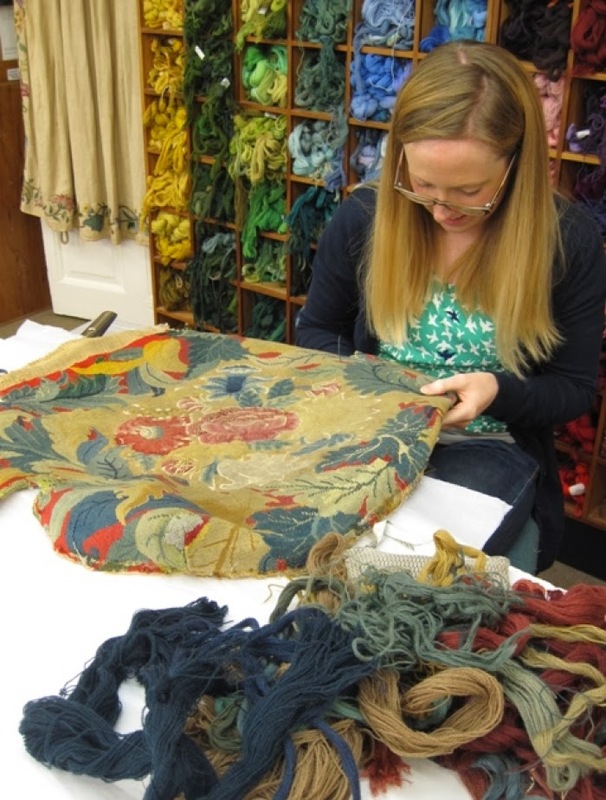 During the 1800's elaborate freehand stitched embroidery began to dwindle as machine embroidery developed but The Royal School of Art Needlework (now Royal School of Needlework) devoted to hand embroidery was founded in 1872 and moved to Hampton Court Palace in 1987. Embroidery is very much making a big come back and a lot of people want to learn it in some form. I am going to take the time next year to take a course in it to add to what I know and to improve my skills. 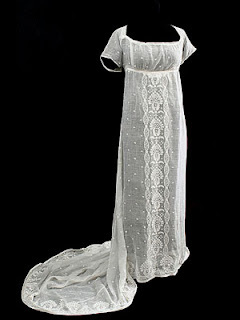 Simple but stunning gown in white work. At Hampton court. Look at all that lovely thread too! 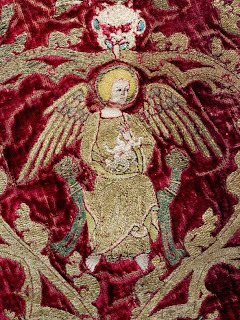 An example of early embroidery. This is a hare that I appliqued and then embroidered his detail, The fabric is from Liberty in London and is modelled on a William Morris design. The linen to which it is stitched is French 1900.